Windows 10 Creators Update is now available for everyone. The Creators Update also brings new features and improvements to the Bash and Windows Subsystem for Linux(WSL). Check out what’s new in Bash and WSL in Creators Update. With Windows 10 Creators Update, Windows Subsystem for Linux(WSL) now supports Ubuntu 16.04. Any new Bash instances installed on Win10 CU will now install Ubuntu 16.04. One of Win10 AU’s biggest annoyances was that it lacked the ability to enumerate network connections which prevented tools like ifconfig, gulp, npm and others from running correctly. The new Win10 CU fixed an issue that users quickly bumped into in Win10 AU was the fact that non-administrators could not ping a network endpoint. Another much-requested improvement is the ability for a tool to register for notifications when a file is changed. This is an essential capability used frequently by web, Node.js, Ruby and Python developers, and many others. For example, if you were working on a node.js website project, editing your source in vim, Emacs, Sublime Text, VS Code, etc., whenever you save your code, you might want your website server to reload your newly changed page source so that you can refresh your browser and see your changes reflected immediately. Importantly, this file change notification support also supports file change notifications for files in the Windows filesystem. This means that you can edit your project source stored on your Windows filesystem using a Windows GUI editor such as VSCode, Visual Studio, SublimeText, Notepad++, etc. and have node.js running in Bash/WSL serving your website locally, and picking up your changes as you save your files! In Windows 10 Creators Update, you can now launch Windows apps & tools from within Bash and you can launch Linux binaries/commands/scripts from within Windows. In Creators Update, UNIX datagram sockets and Netlink sockets, options & properties were added to WSL, enabling various forms of IPC that allow many modern toolsÂ to run on WSL. In Creators Update, the WSL team and Windows Core Networking teams worked together to enable WSL to support several additional IPv6 & TCP socket options & properties. This enables a broad range of tools and technologies that rely upon various network socket features, improved IPv6 support, etc. The WSL improvements listed above are just a selection of the most visible and noteworthy changes, but there are many hundreds of other WSL improvements included in Creators Update. Linux processes exposed to Windows Process enumeration infrastructure so they show up on TaskManager, etc. Because the Windows Console was not originally built to support *NIX, it was unable handle the different behaviors and output formatting codes (ANSI Escape Codes & VT sequences) generated by *NIX command-line tools & applications. 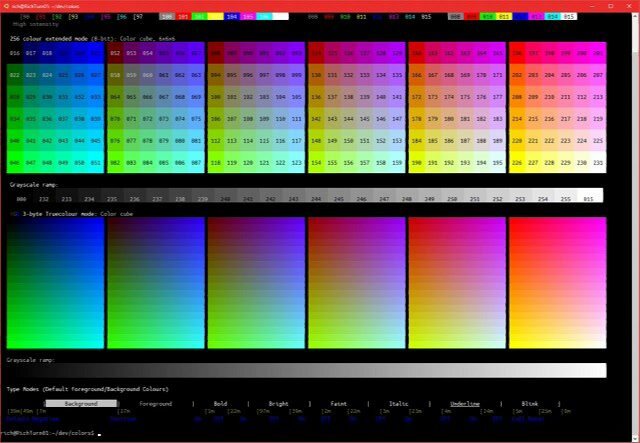 In Win10 Creators Update, the Console has been updated to support full, glorious 24-bit color. With the number of rich, text-based UI’s ever increasing, users wanted mouse support for tools like Midnight Commander, Htop, etc., so we added mouse support in Win10 CU. In Windows 10 Creators Update, the admin-rights restriction has been lifted for users who have enabled developer mode, allowing symlinks to be created from an un-elevated Console.